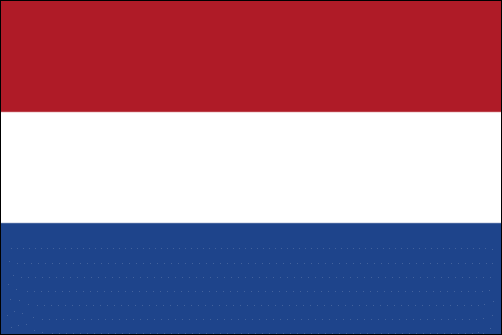 The flag of the Netherlands consists of three horizontal striped colors: red, white and blue. These have been the official colors since the 19th of February of 1937 when Queen Wilhelmina made the royal decision to make these the official colors. The flag stand for the unity and indepence of the Kingdom of the Netherlands. There is an official flaginstruction of the Dutch government for government related institutions that makes clear when the flag should be raised and how (for example half-mast or full). The Dutch flag is often confused with the French flag which has exactly the same colors but instead of horizontal is vertical. 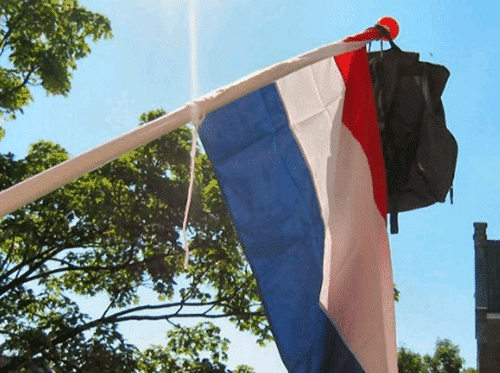 While in other countries it is quite common to use the country flag often and in all kinds of forms, like stickers on your car or backpack, this is not so common in The Netherlands. Use of the flag on clothing or other items is often interpreted as a connection to racism and extreme right wing ideas. Although this is of course not the case in an event of a national or international sports event where local sportsfans will wear the colors of the flag (in an addional to the orange national color). The dutch flag is not often prominently available on regular houses, however on Queensday or when the National Soccer team plays in the European or World Cup many citizens put the flag on their house. Another reason to put the flag on their house is when one has graduated school, often also some books and a bookcase are hung on the flagpole.